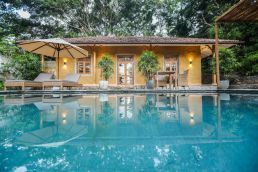 The KK Collection has announced the addition of two new luxury pool villas at its flagship property Kahanda Kanda, located near the thriving tourist capital of Galle on the Southern Coast of Sri Lanka. 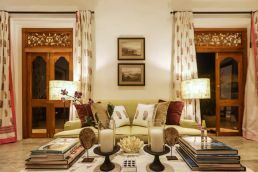 The ‘Kadju’ villa has been designed to take in the sweeping views of the on-site tea estate and lush jungle on which the property sits. Featuring French Windows, intricate Indian prints and a dramatic metal four poster bed with a canopied top, its unique design consists of a shaded entry pathway and lobby with banquette seating. Boasting classical, tropical interiors and an infinity-edge pool, Kadju has been defined as the perfect opportunity for travellers to experience the best of tropical luxury living. 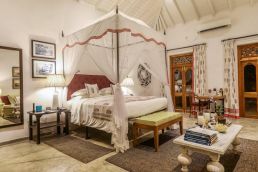 The ‘Kumbuk’ villa has been designed as a cottage-style retreat, set in its own large private walled garden – this villa is the ultimate private getaway. Featuring an outdoor, ‘under-the-stars’ shower and four sets of French Windows, framed by light lime-yellow walls, this exquisite villa overlooks the pool and garden, offering the ideal haven for rest and relaxation. 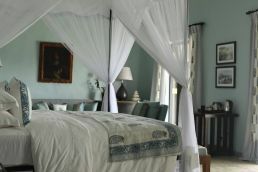 The KK Collection consists of two elegant boutique hotels in Galle, Kahanda Kanda and KK Beach. The award-winning KK Collection is designed to offer luxury travellers a stylish and serenity-focused experience, offering the perfect contrast between the island’s palm-framed beach and lush interiors. The addition of ‘Kadju’ and ‘Kumbuk’, two ultra-luxury pool villas are set to be a haven for international luxury travellers that have their sights set on Sri Lanka, as a tropical adventure destination. Rates for Kadju and Kumbuk villas start at USD $400 per night. For bookings and more information about KK Collection contact The Unique Tourism Collection on 02 9211 6590 or email sally.mckay@UniqueTourism.com or jonica@UniqueTourism.com.